The Uber app in action. You're more likely to accept Uber's higher surge pricing if your phone's low on battery, the taxi app's Keith Chen has revealed in a podcast. Maybe it's something to do with the sense of panic that hits you when your phone's about to die. The higher pricing levels kick in when demand is high: it gets more drivers out on the roads and means the extra demand can be met. Turns out it also reveals some interesting things about the psychology of Uber users too. Uber monitors your phone's battery level so it knows when to activate low power mode, but it won't take advantage of your plight. "We absolutely don't use that to kind of like push you a higher surge price, but it's an interesting kind of psychological fact of human behaviour," said Chen. We're also more likely to pay higher rates when surge pricing levels are at 2.1x rather than 2.0x - it's all to do with the way round numbers give off an impression of imprecision or carelessness, apparently. Although it's main goal is disrupting the taxi industry, Uber has plenty of other irons in the fire: we know the company is working on self-driving car tech, just like Google, and there have been plenty of rumours about it spreading out into the delivery market too. 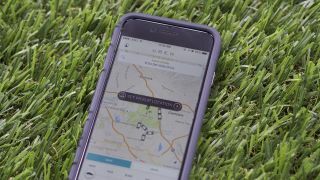 If you're a regular Uber user then it may feel like the taxi-hailing outfit is set to take on the world, but it's not made as much of an impact on the lives of the population at large as you might think - a new survey published this week says that just 15 percent of people in the US have used an app like Uber to get a cab. Would you order a helicopter from Uber?